It seems I am the third person in the School of Graduate Research to be struck down by a flu like thing in less than 24 hours. At least I think so. I complained about feeling a bit poorly and the boss was more than happy to hurry me out the door. Which is why I find myself at home, on a sunny Tuesday afternoon, highly medicated. What’s that I hear you say? Perfect time to write a Whisperer post? Why not – but I don’t feel up to delving into my reader request pile, so I will do a book review. Part of our mission at the whisperer is to take some of the PhD reading burden off your shoulders, specifically by reviewing books on writing and doing your thesis. The other day in the library I noticed just how many books there are on this topic. 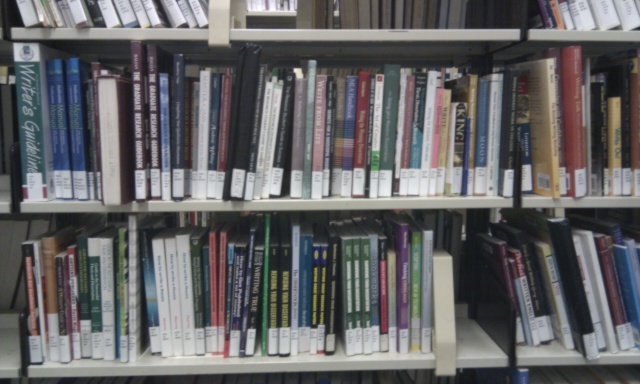 Here is a snapshot of just two of the shelves in the 800’s section in RMIT’s library – and these are books just on editing for goodness sake. What’s a PhD student to do? Anyway, the other day a paperback in the creative writing section by Francine Prose called “Reading like a writer” caught my eye. I vaguely recalled hearing her interviewed on the radio a few years ago, so I borrowed it even though it wasn’t strictly on topic. Well – what a gem this book is. As I have said before – if a book on writing doesn’t make you want to sit up and read it all night you should probably just throw it out (with the possible exception of Joseph Williams “Elements of style”). Francine Prose has a lovely understated writing style which must have taken decades to perfect. She starts each chapter with a story from her life as an avid book reader with such gentle humour that the book just grabs hold of you and wont let go. Before I tell you what Ms Prose has to say I have to make a confession of sorts. When I was doing my PhD I found it almost impossible to read fiction – at least fiction that forced me to think in any way. During this three year period I tended to read popular science for fun. But for true brain downtime – you know, the type which sends you to sleep at night – I turned to trashy books. Deeply trashy books. To prove her point, she uses examples from great fiction to highlight good writing techniques and to trouble aphorisms like “always write short sentences”. Rules like this will be discussed and then followed with examples of great writers breaking them with gay abandon. You see, Ms Prose claims that, past a certain point of competence, you need to learn to pay proper attention to other writers’ prose in order to become a great writer. Now that’s advice that you hear a lot, but what’s great about Proses’s book is she tells you how to do it. For example she begins her chapter on words with a story about her English teacher asking the class to circle every variation of ‘eye’, ‘sight’ or ‘looking’ in King Lear. She recalls her sense of shock discovering the levels of meaning this simple exercise squeezed out of the Shakespeare play. I think this simple exercise can be easily adopted by research students to learn how to write with more authority and confidence. Following the advice of Kamler and Thomson in their great book “Helping doctoral students to write”, I often tell research students to look through papers of writers that they like and circle all the verbs, especially the verbs which the writer uses when they comment on the work of other researchers. Consciously re-using these verbs gives your writing an immediate boost. Ms Prose then turns her attention to sentences; claiming that good writers take apart sentences like mechanics take apart engines – to learn how they work. It’s impossible to include all the insights in this chapter, but one piece of advice she offers is to read your work aloud. It’s a remarkably effective technique to find clunky sentences, especially ones which run on too long. If nothing else you are likely to run out of breath if the sentence doesn’t have the right number of commas in it. While the chapters on narration, character, dialogue and gesture are fascinating, they might be safely skipped if you are reading for non fiction purposes. I recommend you read the chapter on details and on paragraphs however. I particularly like the way she describes paragraphs as ‘breaths’ and the breaks between them as ‘flashes of lightening’. Not only do these metaphors elegantly capture the purpose of paragraphs, but they are easy to remember as you write. Well that’s my self imposed 1000 word limit approaching, so I will go off and medicate myself again. Happy writing! This entry was posted in Book Reviews, On Writing. Bookmark the permalink. Her name isn’t really Prose is it? 🙂 But seriously, it does sound like an excellent book. Thanks. I’ve just come from a seminar with (yet another) student agonising over whether to analyse or write. Analysis isn’t writing, apparently, and my suggestion of free-writing your thoughts as you do the (qual) analysis so you have a trail of why you made the decisions you did over your data was met with terror. Luckily it was backed up by a few other students and a useful discussion ensued. It’s sad that some many people think writing must be perfect, even if it’s not to be shared in its raw form. Maybe I should develop be a post for this blog…? yes her name is really Prose.. amazing eh? Would be great if you started writing posts! Do you mean Joseph Williams “Style: Lessons in Clarity and Grace” or Strunk and Whites “Elements of Style”?